An article in yesterday’s Wall Street Journal illustrates one of the risks in stock swap acquisitions – by the time the deal closes the stock price of either target or bidder could change, sometimes dramatically. What once looked like a good deal could now fall apart. In this case, the article notes that Comcast’s stock price has dropped nearly 10% since the deal was announced, reducing the value to Time Warner shareholders from $159 per share to $144 per share. The deal is set to close in the summer. By that time Comcast’s price could recover – or it could drop further. Meanwhile Charter Communications waits in the wings with threats to renew its own bids for Time Warner. One of the topics that always draws considerable interest in our Acquisition Course in Amsterdam is how to mitigate risk in acquisitions. In the case of the Comcast – Time Warner deal, the risk associated with the change in stock prices could be mitigated through the use of collars. A collar, comes in various forms, but basically outlines how the value of an offer must change with variations in stock price at deal completion. Panel A shows the fixed exchange-ratio collar. This is the most basic collar, setting a minimum and maximum share price at which a deal would be completed. Imagine striking a deal somewhere in the middle of the chart on the sloped portion of the payoff line. Small deviations in the bidders stock price produce deviations in the value received (paid) by target (bidding) shareholders at deal completion. Both sets of shareholders receive some protection from extreme swings in stock price, however. If the bidder’s stock price has increased at deal completion, target shareholders gain and bidding shareholders pay more, but only up to a pre-determined threshold. 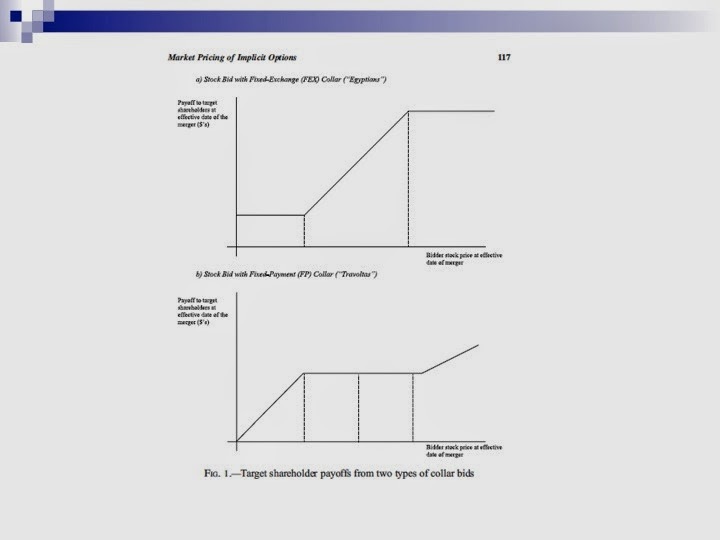 Beyond that threshold, the maximum price is reached, illustrated by the upper, horizontal line. Conversely, a drop in the bidder’s stock price at deal completion results in target shareholders receiving less and bidding shareholders paying less, but again, only to the point of a pre-determined threshold. In this case, the lower barrier identifies the minimum value that target shareholders would receive. Thus, bidders are protected on the upside and target shareholders are protected on the downside. In the case of Time Warner shareholders, there is currently no collar in place. It will be interesting to watch the vote for approval in the summer if Comcast’s stock price remains low. Do Bad Bidders Become Good Targets?